It seemed appropriate to come back from Boston with a copy of Robert B. Parker’s first Spenser mystery, The Godwulf Manuscript. Though I’m sure I’ve read it before, it wasn’t in my own Spenser collection–which is actually pretty small, since I originally read them from my family’s copies back in Vancouver. The ones I own myself (and thus reread often) are all quite recent. Under one of the saplings a boy and girl sat close together. He was wearing black sneakers and brown socks, flared dungarees, a blue denim shirt and a fatigue jacket with staff sergeant’s stripes, a Seventh Division patch, and the name tag Gagliano. . . . The girl had on bib overalls and a quilted ski parka. On her feet were blue suede hiking boots with thick corrugated soles and silver lacing studs. . . .
A black kid in a Borsalino hat came out of the library across the quadrangle. He had on a red sleeveless jumpsuit, black shirt with bell sleeves, high-heeled black patent leather boots with black laces. A full-length black leather trench coat hung open. There’s really no need for us to know any of this, unless it’s to establish how observant Spenser is. (Of course, for some of us, there’s a little nostalgic potential in this evocation of a college campus in the early 1970s–if it’s possible to feel nostalgic for flared jeans.) Spenser also talks to (and about) himself more, and he doesn’t act quite like the Spenser we know later on. He’s already a smartass and a good cook, but he’s more conventionally hard-boiled: a loner, a heavy drinker, and not too principled to sleep not only with the young student he’s supposed to be protecting but with her mother as well (to be fair, the mother comes on to him pretty aggressively, but the later Spenser would, I think, have resisted, and not just because of Susan). This is a bleaker Spenser, too, and now I’m curious about whether there’s any overt connection made between the ways he develops and his relationship with Susan–whom he meets in the second book, God Save the Child (which I now must find and reread as well). Speaking of Susan, it was also interesting to note which of Spenser’s people are here right at the beginning: we meet Quirk and Belson right away, which I hadn’t remembered, but there’s no Hawk, for instance–is their meeting part of the plot of one of the early books, does anyone know, or is Hawk just there at some point? There’s no Rita Fiore yet, no Healy, no Farrell, no Vinnie. I think my favorite thing about the series is that it takes the lone cowboy model of its hardboiled predecessors and gives us instead a community of tough but righteous people who know by instinct what to do and are fearless about doing it. Spenser may go down the mean streets pretty much untarnished, but he’s not alone. Do you remember the original ads for ER, about these being the faces you’d want to see on the worst day of your life? That’s sort of what the Spenser group makes us feel, isn’t it, that if we were in some terrible, dangerous place, they are the ones we could trust to get us out alive, and then to see justice done? Their methods can be as ugly as their antagonists’ and there’s nothing particularly reassuring about a world in which this is the group you rely on, but they live by an unspoken code of honor that is always viscerally satisfying. The Spenser-Susan relationship is my other favorite thing about the series. It’s as good an attempt as I know to imagine a fully adult relationship in which neither partner makes any compromises but instead each one consciously (if not always flawlessly) works to let the other be fully themselves, without apology. It’s true that it is, ultimately, Spenser’s series, and we follow Susan only in relation to him; there are also many occasions when she needs to be protected from physical harm by Spenser or, more often, by his associates (as he’s off solving the case, of course)–but then, there are also many occasions when her counsel is important to Spenser, and the strength of her psychological insight is often acknowledged and used. Their personal life is not the focus of the series (these are crime novels, after all), but Parker likes to mix it up a bit, as in Small Vices, which I recently reread, where Susan proposes that they have a child. Rather than using this as an opportunity for a dramatic change in either the characters or the basic commitments of the series, Parker makes it one more test of their commitment to letting each other be. That’s no small thing. In fact, in most relationships I know anything about, that’s one of the central challenges. I find it interesting that they keep their own homes. That means it is always a choice, an affirmation, when they are together; it also suggests that even romantic partnerships (and theirs is, undoubtedly, romantic!) need to have boundaries, and allow some time and space for complete autonomy. the most rabid fans tend to insist that their favorite writers not only stick to their chosen genre but produce the same book over and over again. That’s why we keep getting robotic, risk-averse re-writers like the late Robert B. Parker. Predictably, as a fan (though not a rabid fan) I don’t think that’s entirely fair. The books are intensely similar but they are not the same, and the variations Parker plays on his themes show ingenuity and skill. Repetition also has its own significance: people do bad things for a narrow range of reasons, and setting things straight looks about the same every time. How could it not? One of the underlying points of all mystery series, too, is that a case may conclude, but crime never does. That said, I admit that one of the attractions of reading a new instalment in the series was always knowing basically what it would be like. It was like visiting old friends–and after all, do we expect our old friends to transform each time we meet them? One reason the late books could be so sparse and elliptical is precisely that we all knew each other so well: there was no need to explain. Why shouldn’t the successful establishment of that kind of trust and intimacy be counted a literary virtue as much as the ability of a writer to surprise us or subvert our expectations? Well, OK, I agree that it’s a greater achievement to do the latter, but it’s still no small achievement to do the former. No doubt it’s partly nostalgia that makes me defensive here: I’ve been reading the Spenser books for decades, after all–not quite since 1973, but since the 1980s for sure, and so it feels as if he and Hawk and Susan just belong in my life, somehow. But I wouldn’t have kept on reading and rereading the books if I didn’t think they were worth it, and I trust myself enough as a reader to believe that if they were no better than “robotic,” I would have noticed. *Before some rabid fan points this out, let me say that I do know Spenser’s office is not at Berkeley and Boylston in The Godwulf Manuscript: he moves there later. 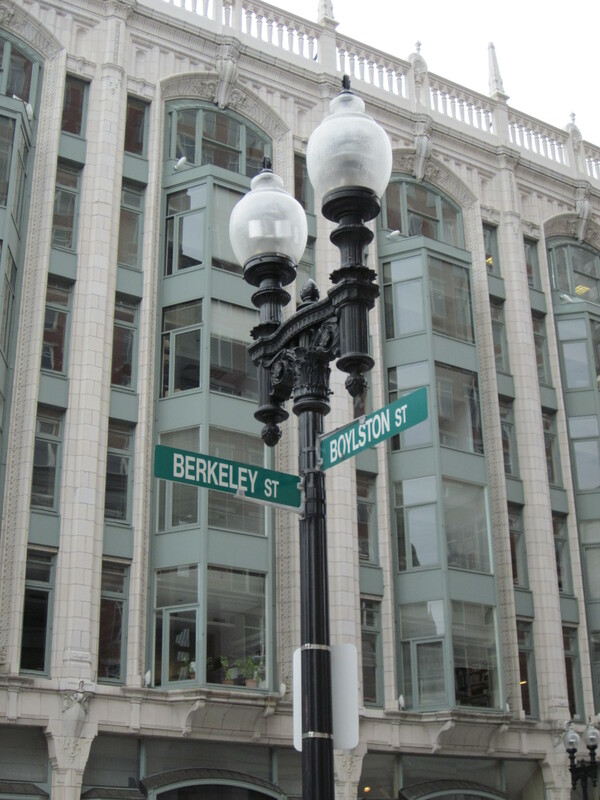 I did not go so far as to tour all the Spenserian locations in Boston, though! Previous Article The Goon Squad visited; I was not at home. my girlfriend and I really enjoyed your article. I was just recently introduced to Spenser by her insistence that I would love the books, I am on the tenth one or so and can answer your Hawk appearance question. What we learn somewhere before book 10 is that Hawk and Spenser used to train and box on the same card and met at the waterfront gym. Now if we only knew why Hawk was sent to central asia. I’m sure Parker had a great story arc in mind. Thanks for your comment, Steve. Now that you mention it, I do recall the general back story about Spenser and Hawk having boxed together, but I don’t remember anything about Hawk going to central Asia–that does sound like it could have been a great story arc, or even another series! The early ones are hard to find but I see that e-books of them are showing up in my public library’s collection so I’m going to revisit them, in order if I can. When you run out of Spenser books, the Jesse Stone ones are also good–and I like that Parker lets his worlds overlap, which adds to the sense that there’s a whole network of righteous fighters out there. Great commentary! I ran across your post while googling the order of Parker’s Spenser books. In the latest Spenser novel, Sixkill, Hawk is in Asia. We don’t know why, and boy would I love to know why. RIP Robert B. Parker.